RecipeTips.com's video on how to roast a turkey. For more cooking tips and advice visit RecipeTips.com. Hi! 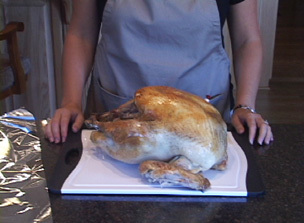 This is Laurie from RecipeTips.com, and today, I am going to show you how to roast a turkey using an oven bag. To get started, make sure that you have a thawed turkey and it is not frozen. Remove all the giblets from the main cavity of the bird, and rinse the bird under cold running water both inside and out, and make sure you pat it dry with a paper towel. You can season your turkey with whatever you like. Experiment with different herbs and different seasonings, but today, I am just going to use a standard salt and pepper. Begin by basting the turkey with any kind of oil you like: olive oil, canola oil, or vegetable oil. It all works fine. Cover the turkey all over the top; then just sprinkle both the outside and the inside with salt and pepper. Using an oven roasting bag makes the turkey very moist, and it also decreases the roasting time; so to prep it, just open the bag, and add about a tablespoon of flour inside. Fold the end of the bag closed, and shake the flour all the way around the inside of the bag. Next, slide the turkey into the oven roasting bag, close it loosely at the opening of the bag, and use the twist tie that comes in the box, and secure it loosely. It does not need to be too tight. Then, take a knife or a kitchen scissors, and just poke six or seven holes in the top of the bag. Place the turkey, breast side up, in a roasting pan, and it is ready for the oven. Place the turkey in a 350 degree preheated oven. This is a twelve pound turkey, so it is going to need to roast for approximately two and a half hours. Make sure when you put the turkey into the oven that the bag does not touch any of the inside walls of the oven. Check the temperature of the turkey to make sure that it is done. The temperature should be at least 170 degrees when taken in the breast and 180 if taken in the thigh. Remove the turkey from the oven bag, tent it with aluminum foil, and allow it to rest for fifteen minutes before carving. For more information on roasting turkey, visit RecipeTips.com.